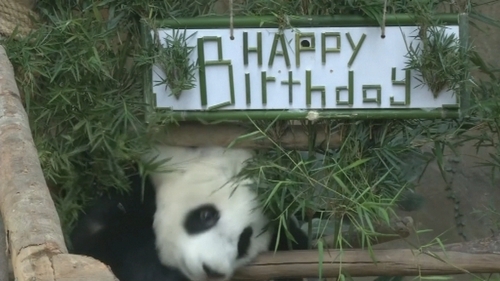 Malaysia's national zoo threw a first birthday party for a female giant panda cub born to parents on loan from China. The cub has yet to be given a name, the zoo said. Her parents, Feng Yi and Fu Wa, have been on a ten-year loan to Malaysia since May 2014. The one year old is less active than her sister but in "good shape", said Mat Naim Ramli, the director of Malaysia's Giant Panda Conservation Centre. The two giant panda parents' first offspring, a female called Nuan Nuan, was born in August 2015 but sent to China in November last year. According to the lease agreement between Beijing and Kuala Lumpur, panda cubs born in captivity must be returned to China by the age of two. Getting the endangered, shy, and bamboo-eating mammals to mate is a famously difficult task. They have an exceptionally short breeding season, with females fertile for just 24 to 36 hours a year, according to conservation groups. It is estimated there are some 1,800 giant pandas left in the wild, living mainly in bamboo forest in the mountains of western China, according to environmental group WWF. China has been sending their black and white ambassadors abroad in a sign of goodwill since the 1950s as part of what is known as "panda diplomacy". The lease agreement with Malaysia was part of celebrations marking 40 years of diplomatic ties.